Since February is National Chocolate Month, I decided to honor the worthy celebration by making at least one chocolate item each week this month! First chocolate dish: Chocolate Mousse! Now this dessert does come with a lesson, so listen closely to what I’m about to tell you……………………MAKE SURE YOU READ EVERY DETAIL ABOUT A PRODUCT BEFORE YOU BUY IT OFF OF EBAY!!!!!!!!!!!!!!!!!!!!!!!!!!!!!!!!!!!!!!! I’ve been wanting to get some porcelain ramekins for a while, and I finally found some for $15 on Ebay. I was very excited about all the recipes I was going to make, when all of a sudden, I opened the box and saw that they were only about 3 inches across and 1.5 inches deep. Definitely not what I was expecting! I was pretty upset, but turns out that they’re the perfect serving size for the mousse. 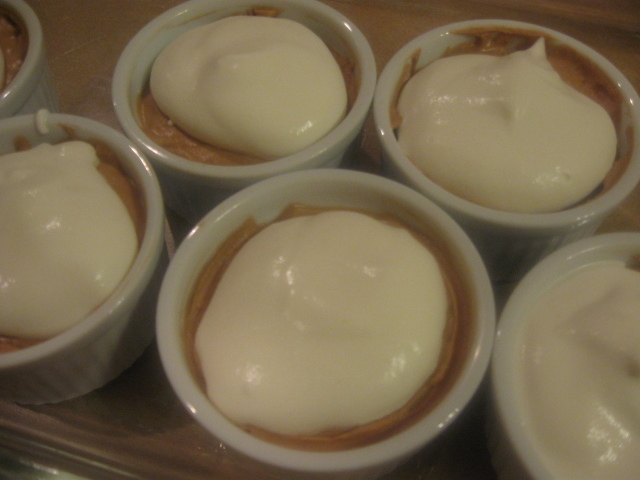 If you have 6-8 0z ramekins, then just double the recipe. I will be buying bigger ones soon, but for now, I’m stuck with this! Mousse is the French word for foam, (can you see the connection to the hair product?) and this dessert is definitely foamy. It’s so light and airy that it’s almost like eating a cloud! I was always a little intimidated by mousse, but turns out it’s so easy to make! The whipped cream adds a great fluffiness to this decadent dessert and makes it look very pretty! Appearance is very important you know! Once you learn this recipe, it’s easy to come up with other flavors of mousse to make. For instance, you could replace the chocolate with a reduced raspberry jam or jelly and make raspberry mousse! Get creative! Whatever flavors you like, you could probably put in this recipe. Melt the chocolate over a double boiler, (see my double boiler tip). While that melts, beat the egg yolk and sugar together with a whisk until it turns a pale yellow and has doubled in size. Add the coffee and whisk that in. 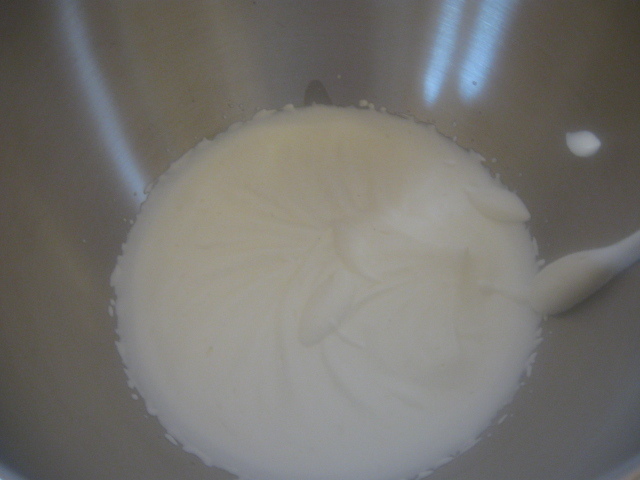 Pour the 1 1/2 c of heavy cream into a stand mixer fitted with the whisk attachment and beat on high until it forms soft peaks. 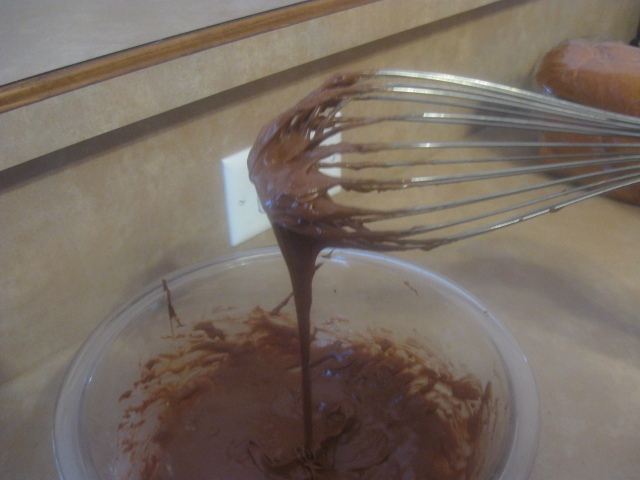 Whisk the melted chocolate into the egg mixture until it’s glossy and smooth. 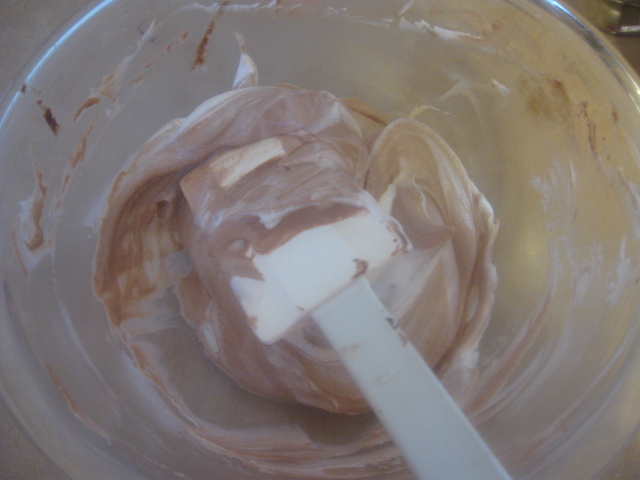 Carefully fold the whipped cream into the chocolate. Here’s how you fold it, start by almost scooping the mixture with your spatula. Then, turn the scoop back onto the mixture! Now repeat this process until all the cream is incorporated. When you’re finished, spoon into individual serving dishes and chill for at least 1 hour before serving. 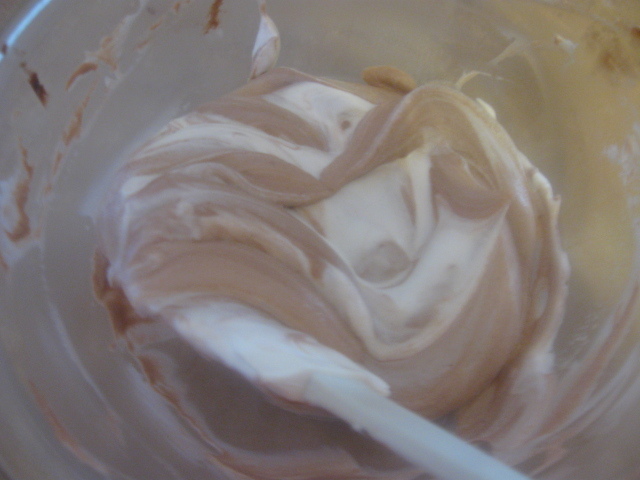 Whip the extra 1/2 c of heavy cream and serve on top of the mousse when ready to present. Bon Appetite! "Chocolate Mousse" was written February 12th, 2011	by Cooking with Katie, and filed under Chocolate and tagged Chocolate, Dessert, Ramekins.